CHK File Recovery is an excellent recovery tool that specializes in recovering CHK files in a quick and easy way. CHK File Recovery accurately and quickly recovers more than 180 common file types, such as mp3, mp4, jpg, bmp, gif, png, avi, rm, mov, mpg, wma, wmv, doc, docx, xls, xlsx, ppt, pptx, zip, rar, exe, dll, sql, mdb, psd. For those unknown types files, you can try to manually recover them using "Identify File Type Manually", which read the content of an unknown file through 4 methods and recover it afterwards. It's easy to use CHK File Recovery. Select the drive where chk files locate, click the "Serach" button, and the program starts to scan the whole drive automatically. 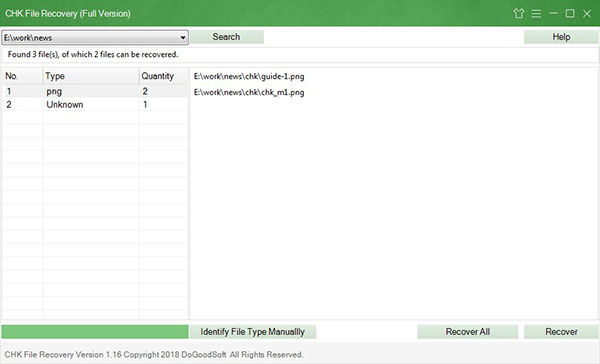 Afterwards, the chk files found are shown in the list on the left of CHK File Recovery by there original file type. Besides, you can also choose to search a specified folder.